The idea behind Green Screen is a cheerful one: to transform unwanted advertisements into something beautiful and inspiring. And it’s led to a nomination for a prestigious media prize. Green Screen, the ad blocker from the Flower Council of Holland, has been nominated for a Spin Award in the Media category. In this category Green Screen is competing against nominees including Heineken, KLM, ABN AMRO and ING. The Spin Awards are prizes for creative concepts that advance digital thinking. They will be presented for the 20th time this year to the most pioneering agencies and organisations on 25 April. The Flower Council of Holland publishes the online inspiration magazine The Green Gallery. The Flower Council launched its own ad blocker in collaboration with UM Studios and Influencer Marketing Agency (IMA) in October 2017: The Green Gallery Green Screen, which counteracts unwanted banners. In their place users see ‘floral artworks’ - works of art featuring flowers and plants. The free ad blocker has exceeded all expectations in terms of downloads in recent months. Green Screen consists of 12 floral art pieces created by tattoo artist Henk Schiffmacher, DJ and producer Loco Dice & graffiti artist Hoxxoh, creative innovator Geraldine Wharry and fashion label Pigalle. They’ve been selected for their love of plants and flowers, which is clearly evident from the ad blocker. 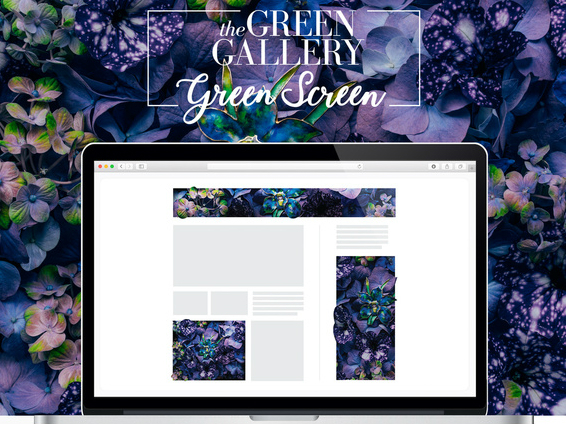 The Green Gallery Green Screen ad blocker has been developed for the Dutch, German, British and French markets, and is intended to increase interest in flowers and plants amongst European consumers.